Thanks to a $2.75 million federal contract, researchers at the National Consortium for the Study of Terrorism and Responses to Terrorism (START) are spearheading an innovative effort to integrate and expand the scientific understanding of threats related to illicit radiological/nuclear (RN) trafficking, smuggling networks, and non-state actors within those networks. The effort will assist in centralizing and analyzing previous and new research in order to evaluate the current Global Nuclear Detection Architecture (GNDA) and adversary threats. The U.S. Department of Homeland Security’s Domestic Nuclear Detection Office (DNDO) awarded START the International Integration and Analysis Project as part of DNDO’s overarching goal to strengthen the GNDA. Over the 18-month term of the grant, START’s Director for Special Projects Gary Ackerman will lead the initiative as the project’s principal investigator. Co-principal investigators are John Sawyer, Brandon Behlendorf, Amy Pate, and Ruth Bluestone, supported by UWT program manager Lauren Grosso. The investigative team boasts interdisciplinary expertise spanning the fields of criminology, political science, risk analysis, geography, and ethnic conflict. The team will employ cutting edge, multi-method analysis to its work using a sophisticated framework including focused literature reviews, in-depth case studies, network analyses, geospatial analyses, fieldwork, threat assessments, statistical modeling and more. “We believe our dynamic research approach toward this project will produce compelling data and flexible strategies that will enable the DNDO to confront and counter evolving threats,” said Ackerman. The International Integration and Analysis Project builds on some of START’s previous initiatives, including the Transnational Criminal Organizations, Terrorists, and Radiological and Nuclear Material (TCOTRN) project completed for DNDO in 2012. 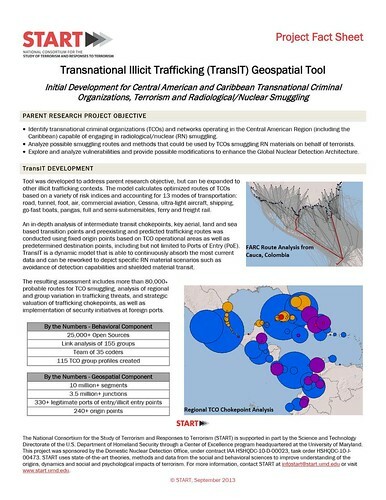 To take into account the behavior of different groups and other regional variables, START will modify the methodology it used for studying Central and South America when expanding the Transnational Illicit Trafficking (TransIT) model to Europe and Africa.